Pressure treated decking is one of the most cost-effective solutions. Due to its affordable price tag, it is easily found. But the cheaper it is, the more problems you’ll have. Not all pressure treated wood is the same. Such wood species are soft, anyway. And so you should expect some splinters and cracks over the years. The cheaper options might twist, warp, and shrink. And once decayed, pressure treated deck invites several insects on board. With good maintenance though, you are looking at a 15-year lifespan. Although cedar is a soft wood, it’s relatively resistant to insects and rot. That’s due to the wood’s oils and tannins. Since cedar is softwood, it will eventually splinter and that’s why it’s often used just for railings. One reason for investing in cedar outdoor decking is its natural beauty. Manufacturers usually use red cedar, which is stunning. But it must be treated to keep its original color or it will soon turn into gray. 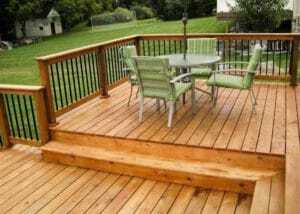 Why people often choose cedar for deck building? It has a good price. It lasts at least 15 to 20 years. And one more thing: cedar won’t split or twist easily because it doesn’t absorb moisture. So, it’s a very good choice. Remember that there are still different quality grades here. Don’t get too knotty cedar. More expensive ones will pass better the test of time. But if you order cedar custom decks, keep in mind that they too need coating every few years and power washing regularly. One of the best tropical hardwood choices is ipe. Cumaru, mahogany, and red tauari are also exotic products, but ipe outdoor decking is the best choice. Its beauty is unparalleled while the price tag is average – higher than softwoods but much cheaper than mahogany. One of the greatest qualities of ipe is density, which also makes it very hard to cut and thus build but also explains its durability and thus long-lasting. It has a deep reddish color that weathers beautifully to a silvery hue. That’s if ipe is not stained. If you want to finish it, you need to let it weather for a couple of months so that the wood will lose excessive oils. That’s important because its density makes it hard to finish. This hardwood outlives any other wood option and that’s another good reason for investing in ipe deck construction.